I have often thought that Italy’s Kingcrow were sort of the odd men out in progressive music. They are certainly progressive rock, but they are also heavy at times, alternative in others, and their sound wavers between the darkness of Riverside and the rock of Porcupine Tree, yet they don’t quite sound similar to either of those bands. Yet, Kingcrow has also been impressing me more and more with each album they release. “In Crescendo” was released in 2013, and it was the first album by them that made me sit up and take notice. Now, we have “Eidos” in 2015, and it may be their best album yet. First, let’s talk music. The album has more of its own distinctive sound than their past work. Band members Diego Marchesi (vocals), Diego Cafolla (guitar), Ivan Nastasi (guitar), Thundra Cafolla (drums), Cristian Della Polla (keys), and Francesco D’Errico (bass) seem like they have put everything they have into making this album special. Right away, I noticed the fleshed out guitar lines from Diego and Ivan that feel fresh and inspired. Francesco’s bass is always a great foundation to these lines, however, and Cristian’s keyboards are lush and very satisfying—almost uplifting. Yet, I think Thundra’s drums take the cake for me. This guy performs remarkably simple portions that can suddenly turn into pulse-pounding feats of technicality. This album definitely contains one of my favorite drum performances so far this year. The album doesn’t focus on long instrumentals, but we do get several, such as the sublime explosion at the end of “If Only”. Lastly, Diego’s vocals are earthy, wistful, and completely perfect for the lyrical content explored. You can feel the anguish, the confusion, and the pain. “Eidos”, if you were unaware, is a word that refers to the definitive expression of the character of a certain type of people. In other words, it’s a commentary on a certain kind of person. 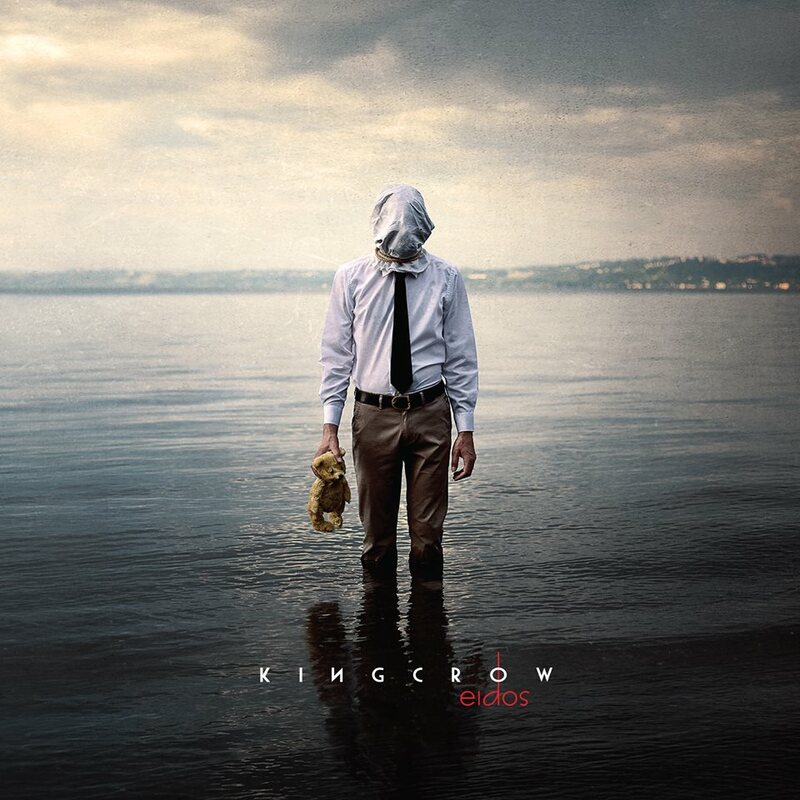 Kingcrow’s new album certainly is that, as it reminds me of Porcupine Tree’s “Fear of a Blank Planet” in some ways. Though I can’t be totally sure, I feel as if this album explores the new generation’s apathy for life and addiction to gratuitousness and the shady corners of their minds. I see “The Moth” as a great introduction to this path of darkness and worthlessness, and we continually see the waxing and waning of the everyman being explored. Questions are abundant, but answers are few. However, unlike other similar albums, “Eidos” explores hope, light, and reconciliation, too. There is hope for a life wasted. There is a light that will lead you home. I really appreciate this kind of deep lyrical concept, as you might have guessed. So, the combination of the music and lyrics on “Eidos” is really what launches this album into the stratosphere. “The Moth” explores the dark corners of our minds with spiraling guitar rhythms and such, while “Slow Down” pleads for reconciliation and forgiveness using delicate vocal melodies as a focus. You get the idea: “Eidos” is well -constructed, well-planned, and incredibly emotional. It’s one of those albums that makes it difficult to choose a favorite track. My favorite, though, is probably the moody technicality of “Adrift”, followed by the catchy guitars of “The Deeper Divide”, the darkness of the “The Moth”, and the raw and heavy meat of “On the Barren Ground”. All the tracks, however, tell a great story, and every track is memorable. For the last couple years, I have been rather obsessed with “Morning Rain”, a track off of Kingcrow’s previous album. I find the spirit and soul of that song have spread to cover almost an entire album now, which is all kinds of awesome. “Eidos” is Kingcrow’s best album to date, and one of the best this year, I might add. Buy it if you know what’s good for your ears.